Feb. 6, 2019, © Leeham News: Bombardier’s new approach to replacing aging 50-seat CRJ200s and address persistent complaints about carry-on baggage issues for the CRJ family follows an example set last year by Embraer. Bombardier’s CRJ550 is a reconfigured version of the CRJ700, with reduced seating, on-board carry-on baggage storage areas and extra legroom. Initially, these will be reconfigured CRJ700s. Bombardier will offer new-build CRJ700s. Embarer last year created the 70-seat E175 SC (special cabin), reducing seating from the 76-seat E175 to a 70-seat E170-sized airplane. Embraer no longer offers the E170. More legroom and greater opportunities for premium class seating come with the SC configuration. The actions by Embraer and Bombardier are driven by the US Scope Clauses. Depending on the airline, Scope limits to 50, 70, 76, 90 seats and by aircraft weight and number of airplanes that can be operated by major airline partners. Delta Air Lines’ partner SkyWest Airlines was the first to accept new-build E175 SCs. United Airlines’ partner, Go Airlines, will be the first to reconfigure CRJ700s to the CRJ550 standard. It’s a makeover of the existing CRJ700 cabins using ATMOSPHERE cabin and United’s Polaris amenities using the length of the CRJ700. The airplane falls within Scope weight requirements, and with the new seating, to replace old CRJ200s and ERJ145s, both eligible under the 50 seat parts of United’s scope clause with their pilots’ union. United initially plans to have 50 CRJ550s in operation. The economics of the reduced seating are a challenge. By eliminating 20 seats from the CRJ700, the per-seat cost goes up 29%. The reduced seating on the E175 SC increases CASM by 8%. The increased CASM on the CRJ700s may work well enough for an older, depreciated aircraft but will be tough number-crunching on new-build airplanes. But there are no clear replacements for the aging 50-seat CRJ200s and Embraer E145s. There are no new-build airplanes in production. There are 34 CRJ700s in storage at January 1 (as well as 20 CRJ900s), a quantity that doesn’t begin to match the replacement demand for the aging 50-seat airplanes. Further, one reason the aging 50-seaters headed for retirement is their poor economics in a rising fuel price environment. United is making the reconfigured CRJ550 part of its rebranded customer experience—a clever marketing move. But the economics as fuel prices go back up should prove problematic. 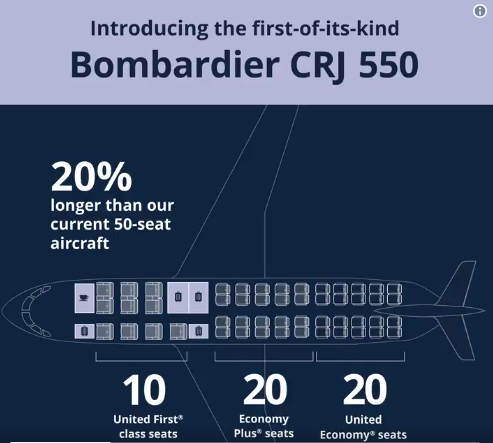 Unlike Embarer Which reduce seat count to make E175 scope clause, United/ Bombardier are replacing economy seats with economy plus and first class seating to meet demand. Reduce economy seat cost will be more than offset by selling first class and economy plus seating. For United to reconfigure 50 CRJ shows that there is a maker for 50 seater RJ but not with 50 seat economy seating. There might be more CRJ 550 order announced maybe Feb 14th quarterly report. Exact concept I thought. I would like to think the new build CRJ-550s are being built at a profit for Bombardier. Regional jets are not the only aircraft that are getting more premium seating at United. The excerpts below are from the 2-6-19 FlightGlobal article at the link after the excerpts. There has to be some explanation other than scope clause for adding more premium seating to A319’s, A320’s, 767-300ER’s, and 787’s. I would be really surprised if the Polaris brand name actually gets used for anything on a regional jet, or anything short of lie flat seating. Putting more premium seats in at the ‘peak’ of boom period where demand is connected economic conditions? It has me scratching my head. I am happy with a Turbo prop and the ones on Horizon I have flown were all stuffed to the gills. Maybe lay flat seat on the wings? And the whole thing does not require new build, you just re-seat (pun intended) the old ones. Scope, no scope, out of scope, in scope sights, sheese, only human beings could muck something like simple A to B and back again up this badly. From some peoples perspective, the “stuffed to the gills” part is EXACTLY the problem. According to the following excerpts from the FlightGlobal articles at the links below, both United President Scott Kirby and the United pilots unions are under the impression that many passengers are not as happy with 5o seat all economy CRJ200’s, as you are with Horizon’s all economy Q400’s, which have pretty much the same headroom, cabin width, baggage bins, seat width, and seat pitch as 50 seat all economy CRJ200’s. “Scott Kirby, president of United, has previously said restrictions on the number of large regional jets with premium cabins puts the airline at a competitive disadvantage to both American Airlines and Delta Air Lines, both of which have larger fleets of the aircraft. UA must know which of its routes possess the suficient F volume to warrant a profitable operation of fifty CRJ-550s. FWIW, the ERJ170 appears too heavy to be transformed into a 50 seater & 65 000 lbs MTOW. The opposite is happening: there is oversupply and demand is decreasing. Even aviation is slowly starting to catch the EV wave, from all the early stage air taxi projects to larger projects such as Eviation and Zunum/Boeing. Also, i guess,advent of autonomous vehicles and huperloop transportation might disrupt regional air services in future. For the high price seats. I assume the back ones are as packed as ever. Sell the premium economy seats with more room for more money of course. What seems to be happening here is US specific regulation (scope clauses) twisting the market to the disadvantage of both the customer who is forced to pay higher prices for legroom they might not want, and the airline who are not able to run things as they otherwise would. Why do you put up with it? I’m not saying legroom per se is wrong – if you can double the pitch and more than double the revenue of seats at that pitch then obviously the airline will make more money. But to do so by regulatory forcing, regardless of the effect of the aircraft’s break-even point, financial robustness against possible future falls in demand, higher fuel prices . . . is that really helping the pilots that scope clauses are intended to protect? the problem largely is based on the fact that the Pilots unions in the US could give F*** all about the working conditions and pay of the regional pilots. it is all about “I Got Mine”. Interesting – are the regional pilots unionised? If not, why not? It would – very unusually – be in the interests of the pilots and would enable growth of their employers’ as there’d be more business for regional aircraft? Or wouldn’t it? regional pilots are generally not unionized. basically they are treated much the same as medical residents (Drs in training) in the US: cheap labor, worked to death for the promise of a big payoff later when they get a job at the mainline and join the union. in general the average time from getting a job at a regional to getting in the door at a major is 5-7 years, although it is not unusual to take much longer than that. during your time at a regional, typical pay (these days, it has gone up a lot recently) is $40k/year. as recently as a few years ago, $18k/year was more typical. typically you get paid for “block hours” which is roughly scheduled flight duration and you don’t get paid for hours spent on the ground between flights. given the short duration of most regional flights, you might have to be at work for 14 or more hours for 8 hours of block time. major airlines think of this the way baseball does the minor leagues, a cheap way to train pilots before they go to the big show. That’s not true at all. While you’re correct that the conditions are no where near as good as mainline the rest. My ex roommate was working 8-12 days a month and made 80k as a first officer his first year at Gojet. Since 2010 the wages have gone up significantly. When I started at a different airline it was brutal as you mentioned. But now this is my part time job. HIs schedules are pretty muc the same as every other airline I’ve seen. Just depends on the routes the aircraft you fly go. Almost no domestic airlines get paid for time on the ground. United gets paid by a blended trip average. Everyone gets paid block ours, that’s the meter. Majors just have better working conditions , everything else is the same. The biggest regional is in the top 10 biggest airlines in the world, or was. Skywest. They have plenty of money and if you’re there 10 years you;ll make 130k work 12 days a month and have 28 days vacation with the opportunity for overtime. 4 day trips worth 8k. It’s not major money, but not peanuts. This is not by regulation, but rather agreements some (not all) airlines have made with their unions. Any knows if the recent “AA” orders for the E175’s are for the standard model or the “SC”? AA’s E175 orders are likely all for the 76 seat standard US dual class configuration. AA’s scope clause is less restrictive on 76 seat aircraft than that of United and Delta. American: 65 to 76 seat affiliate operated aircraft limited to 40% of AA mainline narrow body fleet. Delta and United: 76 seat affiliate operated aircraft limited to 153 aircraft. As the mainline pilot’s unions are fond of pointing out, American, Delta, and United can operate as many 76 seat aircraft as they want, as long as they are flown by mainline pilots being paid mainline salaries. Below is a list of E175’s in service and on order in American’s regional affiliates as of January 2019, according to Wikipedia, all with 76 seats. They have a while to go before they get to 40% of the AA mainline narrow body fleet of about 780 aircraft. Compass: 20 in service, 0 on order. Envoy: 49 in service, 35 on order. Republic : 84 in service, 0 on order. Total: 153 in service, 35 on order. Europe needs a Jetblue equivalent, 2019 could be a big shake for European (U)LCC’s. Maybe EasyJet, Ryanair and Iberia can cease all flights except some to the UK soon. I think it’s a good idea, the CRJ-550 will have a much lower weight and thereby enhance its short field performance over the standard CRJ-700. While there are plenty of E-140 and E145’s, there is a market for a first class section at many small routes. The CRJ-700 and CRJ-550 can operate off shorter runways than the E-145 and offer a better travel experience. Its a chance to upgrade the 50 seat model. Those fancy seats weight a lot. Do you have data that says what the end weight will be? Following are excerpts from the 2-6-19 FlightGlobal article at the link after the excerpt. At the usual FAA allowance of 200 pounds per adult male passenger without a checked bag (includes average weight of carry on bags and carry on personal items), 2o fewer passengers removes 4000 pounds from the take off weight in and of itself. The usual allowance for each checked bag would be an additional 25 pounds. The 70 seat CRJ700’s that SkyWest currently operates for United have 6 first class seats, 16 economy plus seats, and 48 economy seats. According to Mr. Hamilton’s post the new CRJ550 configuration will be 10 first class seats, 20 economy plus seats, and 20 economy seats. The net seat changes from the CRJ700 to CRJ500 will thus be plus 4 first class seats, plus 4 economy plus seats, and minus 28 economy seats. I strongly suspect that the 28 economy seats removed will weigh more than the 4 first class and 4 economy plus seats added. Ahh, my mind is not around the Scope thing. So yes a lower operating weight. Doesn’t make sense to me that they aren’t operating turbo props. The info I have seen from Bombardier gives a roughly 11% more cabin width for the Q300/400 than the CRJ series has? Turboprops are counted in the scope clauses for all the major Us airlines. None of the regionals (other than Horizon) operate Q400s, and with BBD in the process of selling off the Q400 they are not going to invest time and money in new variants for it. The new owners of the Q series can do that. not according to what Ive seen. Anyway the scope clauses were only introduced with the small regional jets , starting with the CRJ200 began flying AND with pilots not with the main pilots union. The claim is that Props are not what people want. Granted its limited, but I have flown a fair number of Horizon flights in various parts of the Western US. All were packed to the gills without any empty seats. Longest was Seattle to Eugene. Got there plenty fast. ATR would be a real dog though. So go figure. The Q400 seemed to be just fine and popular for the shorter and even less shorter routes. Given a choice of getting going to a destination in a Prop job vs a jet I would go with the Prop any day. I did grow up with props and alwyas seemed both they and jets had their place. Smaller towns have lost connected service, service with a prop is vastly better than without it. Both for peole and business. With the pilot shortage, airlines feel its a waste to supply crews for 19-37 seat planes and the trend is going to larger aircraft. I don’t know about the Q400’s, but I have taken many dozens of Dash-8 100 and 300 flights and they were the worst in passenger comfort. Small towns are usually low yield markets as they have little if any businesses that use air travel. The props have had their day and the next gen RJ’s are fuel efficient and quieter. According to the excerpts below from the 1-26-16 Puget Sound Business journal article at the link after the excerpt, the author of the article was less satisfied with the Horizon Q400 passenger experience than you were (“narrow planes powered by noisy propellers”), and Alaska CFO Brandon Pedersen was under the impression that a significant number of passengers weren’t as satisfied with the Q400 passenger experience as you were. I had occasion to fly horizon’s Q400’s from SEA to Bellingham (94 sm), SEA to Yakima (103 sm), SEA to Portland (129 sm), and SEA to Boise (397 sm) when I was living near Seattle from 2012 to 2016. My impression – pretty much the same cabin dimensions as CRJ’s, no first class, by my standards OK for 100 mile trips but not 400 mile trips like SEA to Boise. More noisy than CRJ’s at any seat, and greatly noisier than CRJ’s if you were seated within a few rows of the propellers. In CRJ’s you heard the noise as a high pitched whine or hum, in the Q400’s you both heard and felt the noise as a low frequency rumble and vibration, especially if you were near the propellers. When Horizon’s Q400’s were operating on many routes without competition I didn’t hear much complaining about them, people were used to them and OK with them; however, when Delta starting competing on many of Horizons’ Q400 routes with E175’s, Delta picked up a lot of business pretty fast. Personally, all other things being equal, I would pick an E175 over a Q400, and on many of Horizon’s Q400 routes, Delta is now offering that choice. “Perhaps to the relief of regional air passengers who don’t like narrow planes powered by noisy propellers, Horizon Air is planning a shift back to jets. The company, a sister airline to larger Alaska Airlines, plans to order 30 regional jets in the first quarter of 2016, according to executives speaking during the fourth-quarter conference call Jan. 21. Horizon’s intent is to offer a better passenger experience, while also keeping operational costs down. The new 76-passenger jets will replace some of the Bombardier Q400 Dash 8 turboprops that Horizon now exclusively operates, although it’s unclear how many of the 52 Dash 8s, a twin-engine propeller-driven aircraft that carries 76 passengers, also will be retained. Alaska Air Group Chief Financial Officer Brandon Pedersen said during the call that regional jets offer some advantages in the market. According to the aircraft fact sheets that Bombardier currently has posted on their website, the Q400 maximum cabin width is 1 inch less than that of the CRJ700, and at floor level the Q400’s cabin is 5 inches narrower than that of the CRJ700. The information below is from the Bombardier website at the links after the information. Cabin aisle height for the Q400 is listed as being 3 inches greater than that of the CRJ700. To see the internal cabin dimensions specifications, click on “Download Factsheet” at the bottom of the specifications summarily tables. Do you have a reference for the information from Bombardier that you saw that indicated 11% more width for the Q300/400 vs. CRJ’s? Cabin Maximum Width – Q400: 8 ft 3 in, CRJ700: 8 ft 4 in. Cabin Width at Floor Level: Q400: 6 ft 8 in, CRJ700: 7 ft 1 in. Cabin Aisle Height: Q400: 6 ft 5 in, CRJ: 6 feet 2 in. Its wasnt an actual dimension just a relative one. Fuel costs are far greater too. Small cities would prefer a service over none at all. At least a bit of good good news for BBD, Chorus signs for 9 CRJ900’s. Actually a good photograph of the CRJ900 if into these things. Good for BBD, go figure a dated bird like that (much like the 717) can still be topical. Its not dated . The CRJ700, of which the CRJ900 is a derivative was first flight around 1999, similar time scale to the E -jet family. Engines and wings were changed , among other things from the earlier models. ( CRJ100 1st flight 1991) Likely the only that stayed the same was fuselage width. mixed class 76 seater within the scope limits.